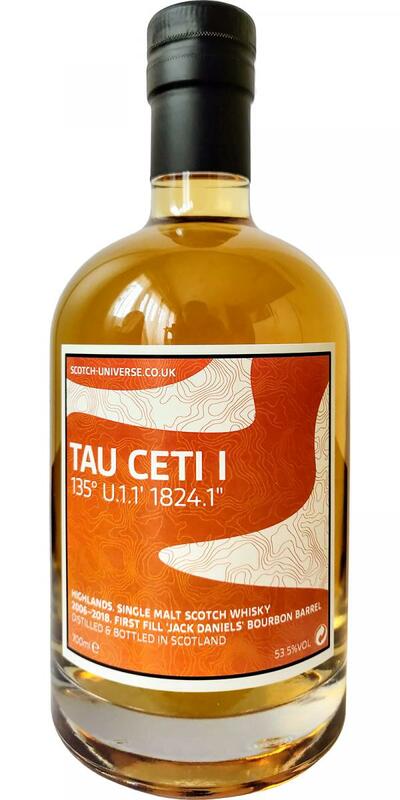 Scotch Universe Tau Ceti I - 135° U.1.1' 1824.1"
Whisky Reviews for Scotch Universe Tau Ceti I - 135° U.1.1' 1824.1"
Vanille bourbon en appel. De Jack Daniels invloed is duidelijk te proeven, en dat doet deze whisky goed. sweetness, candy, marsh mellows. honey and vanilla. the sweetness of this Malt is just incredible. but it is also overwhelming. not too much complexity in this one for me. the sweetness fades away a bit too quickley. but still a really exceptional dram! the casks do show their influence quite impressivly.